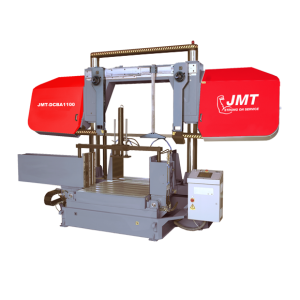 JMT, an industry-leading machine tools manufacturer, is set to release a new line of band saws in the coming months. This will add to their already formidable line up of high quality fabrication equipment. Leading the charge are the new series of automatic DCBA and HBA series band saws. This group of band saws include many improvements to the previous design, among them: more torsional rigid upper saw frames and a much improved heavy duty roller bearing hinge pin, which replace previous designs, providing positive vibration dampening connection to the saw machine base. The new combination hydraulic flow control valve features an infinite controllability of both saw-frame feed rate and cutting pressure, allowing for a wide variation of material processing capability. As with the new DCBA machines every JMT band saw has a gear-driven, direct drive “beltless” blade-drive system. This design delivers approximately 95% of available horsepower and torque to the drive wheel. Because of all of these “cutting edge” features, elimination of blade stalling is now a reality. The light beam rapid saw frame utilizes an optical sensor to rapidly position the saw blade to just above the material, before going into the feed rate, reducing the cut to cut production time, resulting in more cut parts at the end of the day.